On Saturday evening, our family had a group of friends and family members over for an Eggland’s Best Plate Date “Brinner” Party. Our guests were all curious as to what kind of party this would be. Would you guess that there were tons of Eggland’s Best Eggs involved? I was thrilled to get to work with Eggland’s Best on the Plate Date campaign highlighting great ways to prepare eggs for busy families. 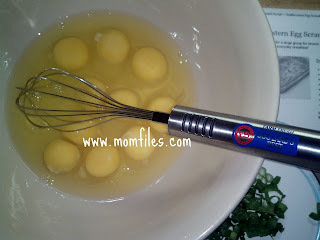 You would not believe the vast ways you can cook an egg! I decided to stick with some kid-friendly recipes that are simple and tasty. I proudly wore my Eggland's Best apron :-) I would of posted photos of my guests but they preferred not to be in them. That, and my husband takes lousy photos! Spray a 13 X 9 casserole dish with cooking spray and set aside (I used pure butter). In a medium bowl, blend flour, salt and baking powder together. Set aside. Beat eggs thoroughly. 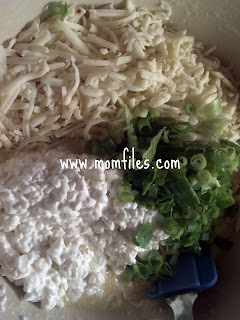 Slowly add in flour mixture, beating well until all ingredients are incorporated. Stir in melted butter, scallions, cottage cheese and jack & pepper jack cheeses and blend well. Pour into baking dish. Bake at 400 degrees for 15 minutes. Remove from oven and cool slightly. Cut into squares and serve. I think that this dish was a big hit! Everyone loved it and they said it tasted like quiche. 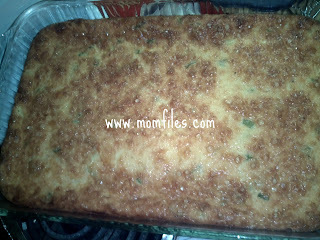 The kids all said it made them think of mac 'n cheese without the macaroni! 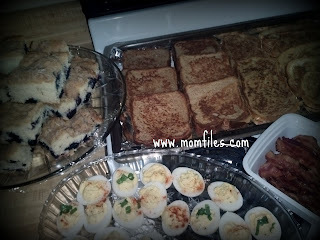 This will be made at my next breakfast/brunch gathering for sure! Our next favorite dish was the deviled eggs. 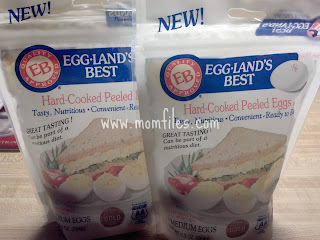 I used the used the EB Hard-cooked, peeled eggs for the very first time. They came 6 to a bag. I opened the bag and was surprised that there was no eggyness... you know that lovely aroma you get when you boil eggs? Yep, none of that! Even when I sliced them in half there was no eggy smell. I tell you what, this is a great convenience for when time is not on your side. No boiling, timing, peeling, cooling or heating up your kitchen. You can't beat that! I made my deviled eggs pretty much traditional with a little twist~ I used mayo, freshly cracked pepper, hot pepper sauce, sweet pickle relish, a little honey mustard sauce and a little bit of milk for a smoother consistency. I topped some off with freshly sliced scallion and left some without. I lightly sprinkled some smoky Paprika as a finishing touch. Simple and delicious! Everyone had such a great time chatting and catching up as well as talking about Eggland's Best Eggs. 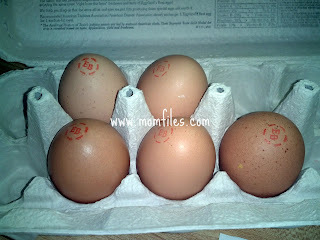 Thanks to the generosity of Eggland's Best, each guest received a coupon for a FREE dozen eggs. I have a feeling I might have converted all my guests into EB fans. 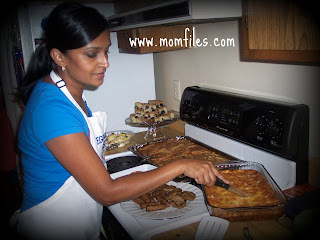 I loved hosting this fun party and I want to say THANK YOU so much to Eggland's Best for making it possible by providing product coupons, cooking utensils and a gift card to help with the extras. Be sure to check out Eggland's Best on Facebook & Twitter! Mmmmmmmm!!! That menu sounds SO good, especially that Southwestern Egg Scramble! Thx so much for these ideas, I'm always looking for something new and creative to do with our eggs, besides scramble them. You look so adorable in your Eggland apron - the hostess with the mostest! :-) Sounds like the perfect "brinner" party! Mmmm mmm! Everything looks so yummy! I have to check out those cooked, peeled eggs. Peeling eggs is not one of my favorite things to do especially when I'm hungry, lol. Everything looks like it turned out delicious! I especially love the casserole recipe. Glad all had a good time. Now I am craving eggs! Shelly, everything looks so good!!!!! WOW!Looks so good. I will definitely be trying this recipe. Thanks for sharing!!! That southwestern scramble sounds good. I was surprised to see cottage cheese as an ingredient, but I'm game to try anything once. Glad you guys had a great time! Looks yummy!! I'm definitely an Egglands Best fan! OMG! All of these items look so "eggs"-citing. I haven't had french toast in so long and it may be time for a comeback! The Southwestern Egg Scramble looks to die for! You really like cooking :) And I like that you like cooking. 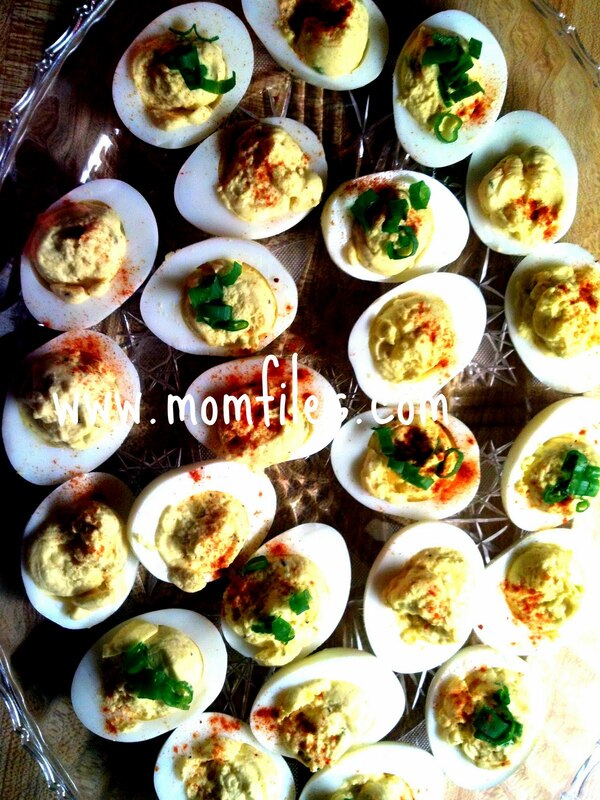 The deviled eggs look especially tasty!